The results from the Fitness Evaluation are then used to write an Individualized Exercise Prescription. The Prescription outlines the steps one should take to attain his or her established goals. An hour long First Work-Out Consultation is scheduled to review results of the assessment, discuss the Prescription, design an appropriate exercise plan, and teach the client proper methods of exercise implementation. After the First Work-Out Consultation, a qualified Trainers Edge trainer is assigned to the client and the hour long exercise training sessions are started. Each exercise session consists of aerobic, flexibility and strength training routines. The trainer keeps a detailed exercise log which allows the tracking of progress. Periodic Follow-Up Evaluations are conducted every eight weeks for body composition measurements and every six months for the entire fitness evaluation. The re-evaluations are necessary to evaluate progress, manipulate exercise variables, and implement new routines to optimize the training regime. Trainers Edge takes pride in its staff of degreed and/or certified professionals who are dedicated to educating and guiding their clients through safe and scientifically sound aerobic, flexibility and weight training sessions. 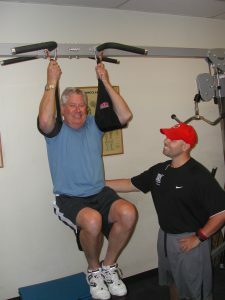 Trainers Edge trainers will design work-outs to meet the desired goals and assessed needs of each client.